The Piazza Collection All Weather Wicker Sectional is designed to bring the luxury of the indoors to exterior spaces. 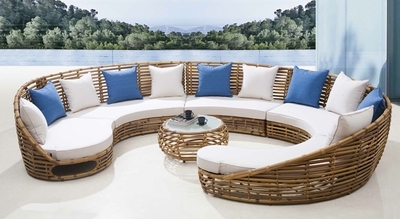 This durable, high grade Viro resin wicker incorporates the sleek lines and textures of the elegant Art Deco era and brings a chic style to any setting, inside or out. The Piazza also comes with Sunbrella fabric cushions and Viro resin wicker in the color Mocca Cream.